Mammograms are able to detect early signs of breast cancers, catching the cancer when it’s more treatable. Many doctors recommend that women begin mammograms at age 40 and have a mammogram every single year. According to the American College of Radiology, there’s a 40% decrease in breast cancer mortality when women start screening annually at age 40, rather than screening every other year between ages 50 and 70. Women at higher risk because of family or personal history should begin screening earlier. Don’t wear deodorant. Aluminum hydrochlorides commonly found in deodorants and some lotions can show up as white spots, which look similar to calcifications or tumors. The technician will take two images of each breast. When you arrive at the imaging center, you’ll be asked to disrobe from the waist up and put on a hospital gown. Some women with large breasts or implants may need additional images. Try to relax. It’s important to relax during the procedure. Work with the technologist to relax the body as much as possible to allow for the most all-inclusive images. It might hurt a little, but it’s worth it. Studies have shown it’s actually painless for about 45% of people, and it’s a little painful for another 40%. The remaining 15% report that mammograms are really painful. But among that 15%, the majority noted that the pain was gone in seconds to minutes. If you’re concerned about pain, schedule the mammogram during days 14 to 21 of your menstrual cycle, because this is when you’re least sensitive due to hormonal shifts in the body related to menstruation. You can also take over-the-counter pain medicine such as ibuprofen about 30 minutes before the test to lessen sensitivity. You can speak up. If you’re in pain during the procedure, tell the technologist, who may be able to reposition you in a more comfortable way. Understand why they compress your breast tissue. It’s important for your breast to be flat so tissue doesn’t overlap and the doctor can see as much as possible. If you understand the reason, it might make the process seem a little less awful. Know it’ll be over fast. Even if the compression is painful, it will be brief for each of the four images. Each compression lasts less than a minute, and a standard screening mammogram usually takes about 15 minutes, from start to finish. It’ll take a few days to get the results. You’ll get an email, a phone call, or a letter explaining your results. If you haven’t heard back from the center or your doctor within about a week, call to follow up. Needing additional imaging for the first mammogram is very common. Doctors will typically compare images to prior mammograms and look for changes. For the first image, it’s more likely they will call you back for additional images. 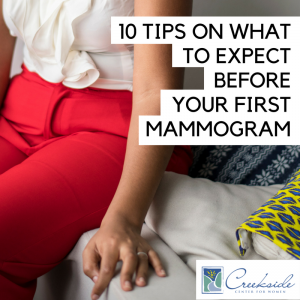 It’s important to have all your mammograms conducted at the same center or to have your images sent on to each new center you visit so the new radiologist can compare your entire imaging history. It’s OK to be nervous. Although screening for breast cancer is a routine medical procedure that’s performed thousands of times each day, it’s OK to be nervous. Many women are nervous about getting their mammogram, whether it’s their first or 20th. Acknowledge the anxiety. If it helps, bring a friend or loved one with you to the screening. Don’t let fear prevent you from getting a test that could save your life.